At the time of writing this, Series 2 has been released only in exclusive colors, including yellow and green from SDCC and lavender from Nerd Block (Series 1 has also been released in all 3 of these colors). A non-exclusive release in the standard MUSCLE flesh/pink color is expected as well, but so far no release date has been given. 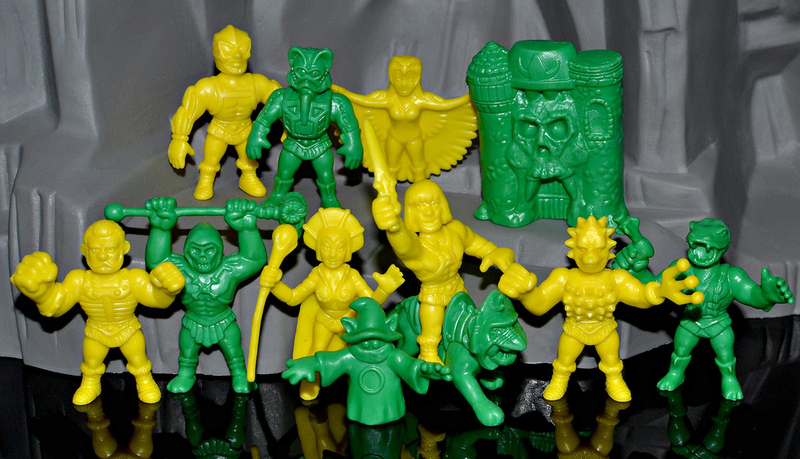 The yellow and green SDCC sets came in long, flat boxes along with the 12 figures from Series 1, as a nod to the classic Kinnikuman MUSCLE 28-packs from the '80s. A very cool and nostalgic presentation! Sculpt-wise, it's obvious the Series 2 figures were designed by a different person than whoever sculpted Series 1. Overall, the style of the designs is much more cartoonish than Series 1, with larger heads, hands, etc. This is especially noticeable when you compare Series 2 He-Man and Skeletor with Series 1 He-Man and Skeletor, which have much more realistic detail. It results in a bit of an inconsistent feel when you look at the two series side-by-side, but overall it's not that big of a deal with the majority of the sculpts. Both series are very well done, even if stylistically different. You've got to love a Grayskull mini, and the fact that He-Man 2 was sculpted to be able to ride Battle Cat! I'm really happy with the characters chosen for Series 2. We got some major characters that were missing from the first series, like Stratos and Evil-Lyn, and other significant yet more unique-looking figures like Orko, Battle Cat and Castle Grayskull. I was pleasantly surprised to also see some characters I didn't think would make it until later series (assuming there will be), like Sorceress and Kobra Khan. 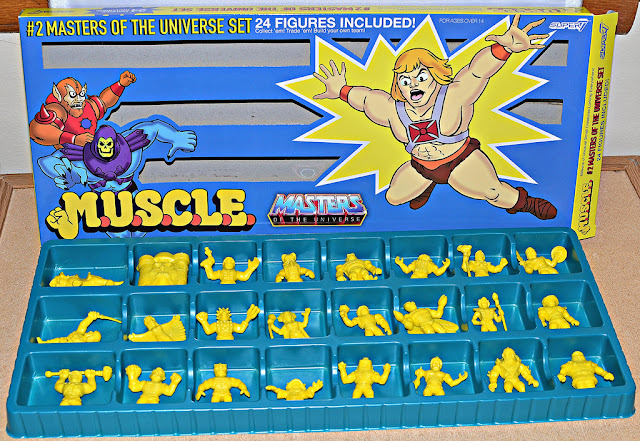 Some might be disappointed to see alternate versions of He-Man and Skeletor already, but I can understand why it's important to keep including the main good guy and main bad guy in different sets -- plus, Kinnikuman-based MUSCLEs did feature multiple versions of Kinnikuman and his nemesis Buffaloman. Series 2 debuted at the same time Super7 re-released Series 1 in multi-color 12-pack cans, which contain figures in blue, magenta, neon green, neon orange, and glow-in-the-dark white. Like the 24-pack boxes, the cans are also based on the old MUSCLE 10-pack cans for the '80s, and are awesome. I'm not sure whether the Series 2 figures will also be released this way. I can't think of much that could be cooler than MOTU-themed MUSCLE figures, and I really hope Super7 milks this line for all it's worth and releases many more series. There are certainly enough characters in the MOTU universe to sustain MOTUSCLE for quite a while. What about you? Have you picked up any of these new MUSCLE toys? 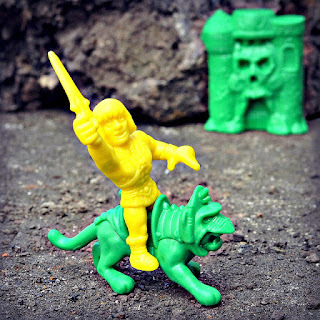 What other denizens of Eternia would you like to see show up in future series? Oh man, that Battle Cat...awesome! Yeah, I hope they make Panthor too! 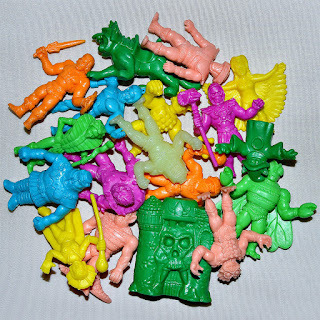 anyone have dupe Glow In the Dark figs to sell or trade? Awesome figure line. I hope I run into these for sale online sometime soon. Is the electric (neon) green part of the SDCC set or the garbage can multipack? Some of the pieces are a darker green and getting confusing. Also did the cans have yellow as well? Answered on FB, but the neon green is from the cans. The dark green and yellow are from the boxed SDCC 24 packs. No yellow in the cans.